Timing and accuracy are what separates the men from the boys. Learn how great boxers win fights with fewer punches and less energy. What is Timing and Accuracy? 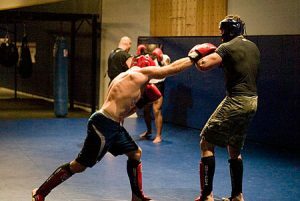 Improving your timing and accuracy will increase your efficiency and effectiveness in the ring. Perfect timing will multiply your force output while simultaneously dividing the effort required. This means you can hit harder while using less energy! I used to be like all those boys in the gym wasting their time trying to showoff their KO-power and endless endurance. I pounded the heavy-bags to death for hours thinking my skills would improve with each passing round. It never occurred to me that if I wanted to fight like a pro, I ought to pay attention to what the pros were doing. After watching the older pro boxers for so long, I started noticing how they trained differently from the younger boxers. They spent significantly less time on the heavy bags and focused more on the speedbag and double-end bags. In the ring, I saw that the professional fighters threw far less punches than the amateur fighters. The amateur fighters seemed to be throwing nearly 100 punches per round whereas the pros only threw about 50. At first, I thought the reason for this was because professional fights can be up to 12 rounds which places a higher demand on energy-conservation. I assumed the professionals were focusing more on out-boxing their opponents as opposed to out-fighting their opponents. While everything I guessed was true, it didn’t explain why the professionals still fought at a slow controlled pace EVEN when they were sparring with amateur boxers. How is it that the professionals are able to spar competitively with less punches? I figured the professionals HAD to be throwing harder punches but it didn’t seem like it. The amateurs swung with more force and attacked with a more ferocious intent. The amateur boxers not only threw more punches but they threw the harder punches. Somehow, the professionals were still able to fend them off. Sure, the professionals were more calm and had better defense but there had to be something more. Thinking I was clever, I tried sparring at a calmer pace and relying on a tighter defense but it still didn’t work. My aggressive opponent easily steamrolled me by throwing dozens of hard punches.Backed into the corner, I had no choice but to throw harder punches and more punches to keep him off me. 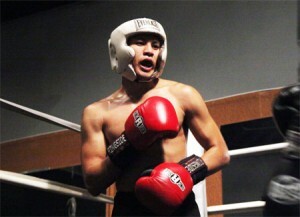 Although I threw LESS punches, I still felt like I was using MORE energy. The pros obviously knew something I didn’t. by using more powerful punches and a more active defense. by using timing and accuracy. Every boxing master knows this. Look at all the great boxers and you will see that timing and accuracy are their biggest advantages over their opponents. Look at Floyd Mayweather, one of today’s most masterful boxers. Sure, he’s got a great defense but if you look past that you will see that he has an amazing connect ratio! He throws the fewest punches but lands at the highest connect percentages in the entire sport. Think of a baseball player swinging the baseball bat. If he swings too early or too late, he will miss or the force arrives off angle and strikes with less power. Hitting the ball at the right time makes it go the farthest! Think of where the bat strikes the ball. If the bat strikes the ball far from the center, it might strike the ball at an angle forcing the ball to go straight up into the air or bounce down into the ground. However, if the bat strikes the ball accurately at the center, the maximum force will be transferred sending the ball the furthest distance in the intended direction. 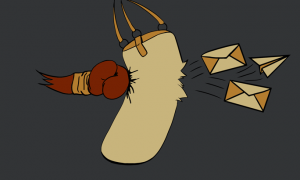 Work on the speedbag and double-end bag more often. These pieces of equipment are perfect for building higher-level boxing skills! You’ll probably notice by now that these bags rely purely on timing & accuracy. If you punch the double-end end bag right as it’s moving towards you, you’ll connect with a solid hit even if you don’t use much force. In contrast, if you’re throwing hard punches while the bag is moving away there will be little impact. Not only do you have to time the shot, you have to punch accurately at the bag. Simply put: if you hit the bag at the wrong time and/or in the wrong place, you’ll miss or your power will be deflected off the sides of the bag. The speedbag and the double-end bag do not care how much power or endurance you have. If you do not aim and time your punches, they will not be effective! Training your timing & accuracy requires a sharp eye, a sharp mind, and serious skills. If you can’t hit a bag that’s right in front of you, imagine how much trouble you’ll be in against a masterful boxer that’s moving around the ring against you! Do not stop at just the simple goal of just being able to throw many hard punches. At the higher levels of boxing, you will be forced to hit a constantly moving target. If you ever want to improve your boxing skills beyond simple power techniques and cardio endurance training, you’ll have to build some sharp timing and accuracy boxing skills! Everybody knows at the higher levels of boxing: it’s all TIMING AND ACCURACY! awesome article!! I always punch heavybag more than 12 rounds but still have problem about hitting and knock down opponenet in sparing even though i have decent punching power. i think i will train more on speed bag and double-end bag and improve the timing and accuracy. Hey Coach great website I always read your articles but never commented.I have a question about the speedbag.Is it better to punch it or do like in movies at a close range.My trainer said to me to punch it so i really train boxing and the “like in films” tech is good but doesn’t really improve boxing. In my opinion, close range is better since there are more skills you can practice. It’s the way I learned and the way I see most people do it. Either way you can still “punch” the speedbag even at close range. I hope I answered your question. G’day Johny. How do i email you? I want to send you a photo of my boxing invention which we have in our gym. Speed bag is great for using how you are but it can also be used to practice your hooks, if you hit it right it will stop dead on the boad with the right follow through. If you go on you tube there is a great video by freddie roach on how to practice the left hook on the speed bag. Just make sure you punch away from the wall lol. what type of double end bag to buy? greetings from Paris! I am decently tall (5.9 ft) with quite short range (69.7) and therefore get out jabbed by opponet with same height or taller than me ( we even have this tiny short due with giant enght arms with longer reach than me). I decided to really improve timing, accuracy and head movement to close distance safely. Therefore I am thinking of getting myself a nice double end bag and found lost in front of quite a lot of different shape and style: classic round one, drop shape, american ball and mexican ball. Which one would you advice me to buy to achievemy goal? Thanks in advance for any tips you may have! The classic round one is probably better for beginner than the drop-shape one because the round one is easier to hit with uppercuts. The mexican ball allows for morefun angles and body shots. But you can mimic a body attack by just hitting the rope below the bag. I’ve seen lots of pros do that. As for the american ball, I’m sorry I don’t know what shape that is. Maybe you can show me a picture? AHHHH!!! Ok, I saw the double-balled (American style). It’s just a disconnected version of the mexican double-end bag but seperated into 2 balls to force you to have more accuracy. They’re both fine. I would recommend either for you EXCEPT the tear drop shape. @ Jon – keep up the work and soon he’ll have to let you. Keep us updated on how you do! 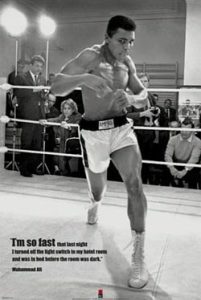 @ Dwayne – The speedbag trains timing and rhythm. It doesn’t really train reflexes because you’re not really actively reacting to it. You can practically do the speedbag blind, which kind of proves that it doesn’t rely so much on reflexes. You can slip and duck around the bag but it’s just not the same as working with focus mitts or double-end bag. Great article. What are the drills you recommend for training partners outside of sparring and holding hand pads for each other? I feel like part of a professional’s advantage is their deeper wisdom of how an opponent moves, and this is gained from time moving with another body. Perhaps drilling certain techniques with a partner is a lower impact way for amateurs to get up the curve quicker, and to gain the insight that the pros have with regard to timing and accuracy. 2) not allowed to panic-block. In other words, they are not allowed to jerk their head out of the way if they miss the block. The drill should make it so that fighters are not busy trying to defend all punches. They are simply mimicking all areas of a fight and working on whatever technique they like without being punished if they get countered. @ken – The speedbag is pretty hard to substitute. I don’t know of any contraption that does the exact same thing. As for a double-end end, there are several guides out there on the internet that will teach you how to make one for free using household items that cost around $10 total. The double-end bag has to be my favorite peice of equipment. As a taller boxer it provides great practice for boxing shorter oponents with good head movement/slipping skills. It’s also one of the cheaper peices of equipment a boxer can buy for home practice. However, there are other options. A simple piece of rope can be a decent substitute. String it across a space just tight enough that it bounces about a foot (1/2 foot up and 1/2 foot down) with a light tap of your glove. Give the rope a tap and try to punch above and below the rope without it touching you. Practice upercuts in-front and behind the rope. It’s also a great way to practice slipping and counters. I got meself a nice double end bag from Montana. However I am still striking to get the tension of the elastic rights. It does not bounce back enough. I will release the tension a little bit then it is jumping up and down. Might come from the fact that my ceilling is not high enough. From what I have seen, it is better to have the top part string longer than the bottom ones. If I do that, the ball will be at the level of my belly button. Pretty useful to train to fight midgets but not for me! Any advices guys! Thanks for your help! @Jerome – Get rid of the cheap elastic that comes with the bag (nobody uses that) and go to a hardware store and buy some heavy duty rubber cord. You should also visit a real boxing gym nearby and see what they use. @Greg – I agree completely! Im a beginner on this sport, but putting a lot of effort on it and as U had said accuracy and timing are very important in boxing. I usually hit the double end bag with a 1-2 or 1-2-3 combinations, should I keep on using them untill i master them or do you have some special combinations for double end bag that you can recomend me to improve my timing and accuracy?? Try throwing left-left-right…and then right-right-left. You can throw whatever punches you want. Throw the first 2 real fast without much focus, put all your focus on the 3rd one. This is a standard drill I’ve seen used by many pros. I will be explaining it later in a seperate article. hi johnny..do professional boxers train with reflex bag? whats the difference between double end bag and reflex bag? i just bought a reflex bag…and i was just wondering if its gna help me on my speed punches,accuracy and slipping? or would you prefer a double end bag??? Sicnarf, I prefer the double-end bag because it stays at the same height and has a nice rhythm to it. The reflex bag rebounds kind of slow for me and swings at weird angles making it pretty hard to build rhythm with it. I’ve also never been officially trained to hit the reflex bag and don’t see it in many gyms so maybe that’s why I’m a bit biased. I’ve also never seen a pro work the reflex bag. Thanks BFA! Very nice to have a pro stop by. I feel this article is amazing. May i get your opinion on this video johnny? I posted that video on the ExpertBoxing facebook a while back. It’s a good video and 100% true. floyd mayweather is a very acturate puncher like seen here https://www.youtube.com/watch?NR=1&v=3gniV1p8iYA&feature=fvwp but still dont you think i could be as well timed and a on the money as he is, if i could be what would i need to do to be able to do what he can what type of timing and acturacy training would i need? You’re reading the right article, Curtis. The answer is up there. Timing is indeed one of the most underrated skills in boxing. I used to love watching 5’6 3/4″ Light Heavyweight Dwight Qawi out jab much taller and longer armed opponents. Qawi demonstrated that shorter, short-armed fighters don’t need to neglect the jab against taller opponents and that out jabbing someone is a matter of timing more so than having superior height or reach. I would really appreciate it if me know what you think of this exercise it’s kind of like a double end bag that moves around more and is a lot less predictable. Thanks again Johnny for this incredible website and taking time to share your information with so many people. Jason, that actually sounds like a lot of fun! Punching something so unpredictable. Hey Johnny. I want to share my experience with you and also ask you a question about it. I wasn’t using the double end bag until a few months ago. I started using the double end bag mainly for developing fast combinations with proper technique and also working hand-eye coordination. During the time I was using the double end bag, I wasn’t working the heavy bag. After that, I went back to the heavy bag and, all of a sudden, I felt that my punching power improved, although I am not sure about it. 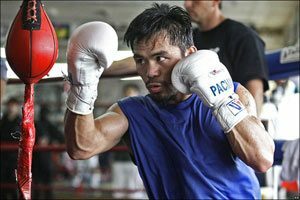 I also felt that i have more snap in my punching, maybe because of the improved hand speed/relaxation that the double end bag develops because you’re not loading your punches as much. My question is: is the double end bag a good tool for indirectly improving punching power? Are my punches harder only because I have more “belief” in my punching accuracy? Are my punches harder because of more repetition punching (because I threw a lot more punches than at the heavy bag)? Are my punches harder because working on the double end bag develops more relaxation during punches, not loading like punching the heavy bag? Or is it just a feeling I got and my improved punching power doesn’t exist, it’s just in my imagination because aiming seems easier and faster? YES, the double-end bag is AWESOME for improving punching power. It really helps you develop far more advanced punching skills such as range, timing, relaxation, speed, all that. The double-end bag improves your punching technique tremendously which is why many higher level boxers use it, and at the same time lower level boxers are unable to enjoy it. Good for you, Josef. Hi Johnny! Just wondered if you’ve ever heard of the Reballdo? It’s basically a small ball fastened by an elastic cord to a headband. I’ve heard several professional boxers use it, and it’s said that it was an important part of Kostya Tszyu’s training. Seems like it would be great for improving timing and accuracy. I’d like to know what you think about it! I’ve seen it used a lot and I think it’s great. I’m a big fan of Kostya Tszyu. Hi Johnny can you please let me know if this double end bag is good for improving rhythym timing and accuracy here is the link http://www.sugarrays.co.uk/shop/fighting-sports-pro-elite-double-end-bag.html. Also does this bag increase speed? It looks like a standard double-end bag to me. It should do the job fine. And yes, it will help you develop hand speed for faster punches. bro you are awsome its work for me i really enjoying boxing thnx . I just want to thank you for all this time you have put into this site. Its Awesome Your Awesome. Keep Going. The speedbag is so difficult. I have recently taken up boxing training and I find it really hard to get it to swing straight, obviously my accuracy isn’t very good but I think my timing is ok. Is there any specific activity I can do to work on accuracy? Try some pad work, its good for working on accuracy. Using the focus mitts would be great for this! Hey coach, I was just wondering could I use the speed bag to train my reflexes, I figured since the bag is already moving at a high speed could I like punch it and get it moving fast band practice slipping and ducking under the moving bag since I don’t have a double end bag For More Info Hey coach, I was just wondering could I use the speed bag to train my reflexes, I figured since the bag is already moving at a high speed could I like punch it and get it moving fast band practice slipping and ducking under the moving bag since I don’t have a double end bag. The speedbag is actually more for rhythm, timing, and endurance. The speedbag isn’t built for reflexes because it doesn’t challenge your mind to think that way. The bag moves in a very predictable manner and in a very predictable rhythm. If anything, it can help your “reflexes” by teaching you how to feel the rhythm in your body and in your opponent’s movements. But it doesn’t actually develop your reflexes in training your mind to react quickly.